The weekly bill auction conducted yesterday recorded mixed results, with the weighted average on the 364 day bill maturity remaining steady at 9.43%, following two consecutive weeks of increases, while the weighted average on the 91 day bill increased for a second consecutive week to 8.37% by 02 basis points. All bids received on the 182 bill were rejected. The total offered amount of Rs. 14 billion was fully accepted with the bids to offer ratio increasing to 3.30:1. The bearish sentiment in the secondary bond market continued, with minimum activity witnessed yesterday. Only the 15.03.23 was traded at 10.45% once again while on the very short end of the curve, Treasury bills consisting of November 2018, January, June and July 2019 changed hands at levels of 8.60%, 9.00%, 9.38% to 9.40% and 9.42% to 9.45% respectively. This was ahead of the Treasury bond auctions due today, where a total amount of Rs. 80 billion will be on offer consisting of Rs. 35 billion on a 7 years and 3 month maturity of 15.10.2025 and Rs. 45 billion on a 14 years and 6 month maturity of 15.01.2033. This is in lieu of a Treasury bond maturity of Rs. 90.71 billion on 15 July. The previous Treasury bond auctions conducted on 28 May for the maturities of 15.03.2023 and 15.03.2028 recorded weighted averages of 10.51% and 10.72% respectively. 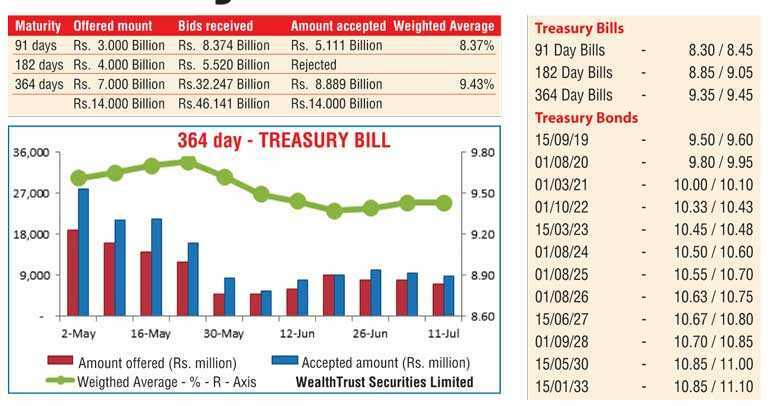 The total volume of Treasury bonds/bills transacted in the secondary market on 10 July was Rs. 0.55 billion. In money markets, the OMO department of Sri Lanka was seen injecting an amount of Rs. 12.00 billion on an overnight basis by way of a Reverse repo auction at a weighted average of 8.44% as the net liquidity shortage stood at Rs. 16.64 billion yesterday with a further amount of Rs. 16.70 billion been drawn down from its Standing Lending Facility at 8.50% against an amount of Rs. 12.06 billion been deposited at CBSL’s Standing Deposit Facility (SDF) at the rate of 7.25%. The overnight call money and repo rates averaged at 8.49% and 8.36% respectively. The USD/LKR rate on spot contracts was seen holding steady to close at Rs. 159.25/35 for a second consecutive day as markets were at equilibrium. The total USD/LKR traded volume for 10 July was $68.60 million. Some of the forward USD/LKR rates that prevailed in the market were 1 Month - 160.05/25; 3 Months - 161.75/00 and 6 Months - 164.15/45.